GTS Packages includes AUO/BenQ 240 Watt solar modules and select from a variety of inverters. 1. Either AUO/BenQ 240 watt solar modules All modules are supplied with "MC" interconnects. 2. UniRac® SolarMount™ code-compliant fl ush PV mounting structure including rail set with L–feet, top–clamps and splice kits. 3. Pre-wired SunWize Power Center for the grid-tie inverter consisting of an aluminum back panel, NEMA 3R, AC and DC disconnect switches and an optional cumulative kWh utility-grade meter. The Power Center is designed to facilitate easy on-site installation of the inverter. • SMA SB1800U, SB2500U SB3800U or SB6000U. 5. Wiring – Includes #10 AWG MC interconnect extension cords and wire clips, PV grounding system, PV fused combiner if needed (noted with ~ in charts), and array wiring pull boxes. 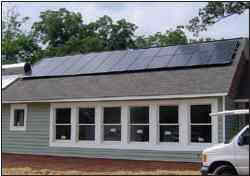 The home-run wiring from the solar array to the main panel is supplied by the installer. 6. Documentation - Includes electrical drawings, data sheets, warranties, installation instructions and owner's manual.